When I lived in a tiny rent house, I had to reconsider every possible storage solution to maximize our tiny space. One thing I learned then was to use a tension rod to hold my cleaning supplies. 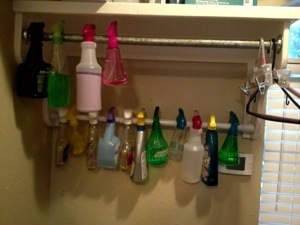 This allows you to hang your bottles wherever you like. If you look carefully, you can see my cleaning products hanging above my sewing machine. What I like about this: even though I use mostly green cleaning products, this keeps them out of reach from my kids. It’s a much safer option than storing them under the sink.